105.5 FM KSNX - Classic Hits Radio » The Blue Man Group…. 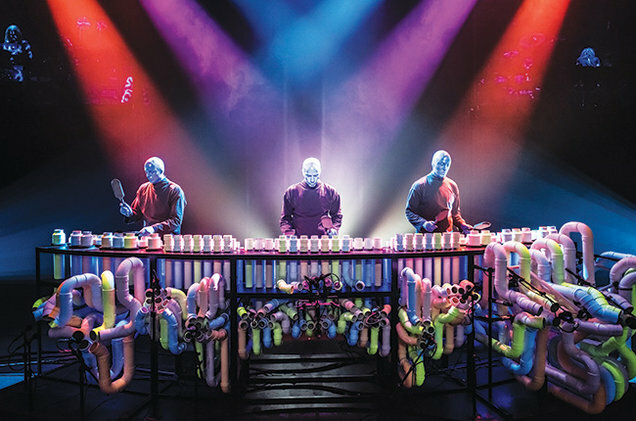 For 25 years, the neon-lit troupe Blue Man Group has drummed its way into the ­mainstream, from an Orlando resort to a luxury hotel in Vegas. In the quarter-century since its debut, Blue Man Group has infiltrated popular culture, on The Tonight Show With Jay Leno, Arrested Development, Scrubs and in a witty series of ads for computer company Intel. New York natives Wink and Goldman, and Georgia-raised Stanton (who no longer regularly perform in the show) have seen Blue Man Group become a steady live attraction, with ensembles based in Boston, Chicago and Berlin. One troupe performs regularly at the Universal Orlando Resort. Another is playing cities across North America through June, reaching smaller markets from Eugene, Ore., to Reading, Pa. An international tour opened in Singapore in March and proceeds to New Zealand this month. A visit to Manila in the Philippines is planned in the fall. And the Luxor Hotel in Las Vegas is the latest venue to welcome the azure, bald-headed characters in an extended engagement.